The first book on double entry system was written by an Italian mathematician Fra Luca Pacioli and his close friend Leonardo da Vinci. The book was entitled as “Summa de arithmetica, geometria, proportioni et proportionalita” and was first published in Venice in 1494. 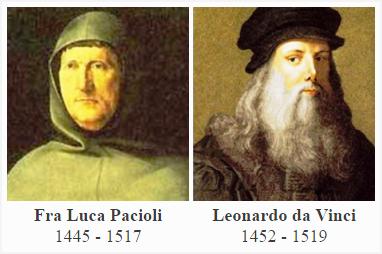 Pacioli and da Vinci did not claim to be the inventors of double entry system but they explored how the concepts could be used in a more efficient and organized way. Pacioli wrote the text and da Vinci drew the practical illustrations to support and explain the text in the book. The book was divided into various sections and the one that talked about double entry system was entitled as “Particularis de computis et scripturis”. It was further divided into many small chapters describing double entry, journals, trial balance, balance sheet, income statement and many tools and techniques subsequently adopted by many accountants and traders. Before pacioli’s contribution, some form of double entry system was already in practice. No one knows exactly when and how it was invented. However, it was pacioli’s book that introduced the system in Europe and other trading countries of the world. As the acknowledgement of his work, Pacioli is known as the “father of accounting” by modern accounting professionals. The double entry system of accounting or bookkeeping is based on the fact that each business transaction essentially brings two financial changes in business. These changes are recorded as debits or credits in two or more different accounts using certain rules known as ‘rules of debit and credit’. In double entry system, every debit entry must have a corresponding credit entry and every credit entry must have a corresponding debit entry. It is the basic principle of double entry system and there is no exception to it. For example if a business purchases furniture for $500 cash, the value of total furniture is increased by $500 and at the same time the cash amounting to $500 is decreased. If the business is using double entry system of accounting, it must debit the furniture account by $500 and credit the cash account by $500. See the rules of debit and credit. 1. Original records (journal and subdivision of journal): The transactions are first recorded in a book called journal which is further divided into various subsidiary books such as cash journal, purchases journal and sales journal etc. The number of subsidiary books to be maintained by a business depends on its nature and size. 2. Classification (ledger accounts): In the second stage, all transactions relating to the same person or thing are collected and stored in one statement called account. The book in which these classified accounts are kept is known as ledger. 3. Summary (profit and loss account and balance sheet): After certain periods, the ledger accounts are balanced and a statement called trial balance is prepared which is further used for calculating profit or loss and determining the financial position of the business. Under double entry system of accounting, the two aspects of each transaction are recorded (i.e., for every debit there must be a credit and vice versa). It creates an equilibrium within the records which helps in detecting errors, omissions and frauds. Under this system, a trial balance can be prepared to check arithmetical accuracy of all accounting entries. The trial balance can be further used for finding out operating results by preparing income statement and determining the financial position of the business by preparing a balance sheet. Double entry system is the most advanced and useful form of maintaining accounting records and is extensively used by companies worldwide. Without this system, a company would not be able to compare its financial statements with that of other companies. Double entry system is highly systematic that follows certain rules and principles so it is easy to find information about a particular transaction or account quickly when needed by owners, management, accountants or other employees. Almost all accounting standards and laws in the world require the use of double entry system of accounting. If a company fails to comply with this requirement, the auditors will not accept the financial statements of that company. The financial reports and results generated by double entry system is reliable to great extent for decision making purpose. The double entry system is complex enough to require skilled and qualified employees to handle the whole process of maintaining accounting records. Therefore, its employment may be costly and time consuming for small businesses. The advantages of double entry system far outweigh its disadvantages. Double entry system has, therefore, become the standard and in many cases a requirement for maintaining accounting records of medium and large size businesses. Most of the manual as well as computerized accounting systems are based on it. YEAH U RE RIGHT ABSOLUTELY RIGHT.